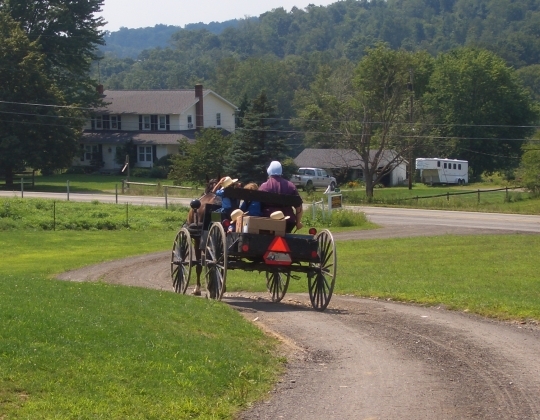 The New Wilmington, PA Amish community numbers 19 church districts, and around 2,500 souls. It is quite a recognizable group by its brown-top buggies and powder-blue doors on everything from homes to schools to milkhouses. I thought I’d share a few photos you might enjoy from last summer’s visit. Which one makes you miss summer most? 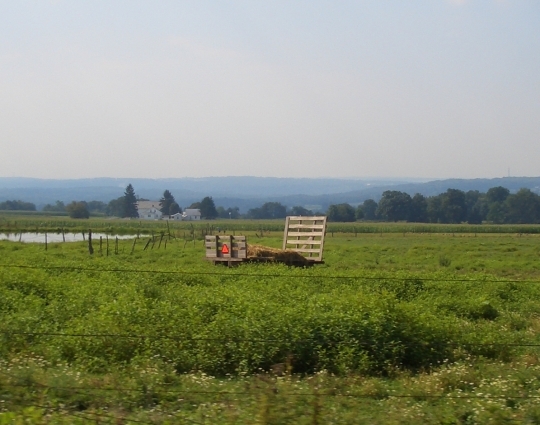 The New Wilmington Amish community, located an hour north of Pittsburgh, has come up a number of times on this site, dating back to a post on the history of the group, and most recently in last Friday’s Amish pay phone post. You can also read about New Wilmington-area Teena’s Quilt Shop, a local auction, and a New Wilmington children’s school Christmas program. Thanks Alice! I guess what prompted my question was being on the cusp of another long Polish winter and feeling that inevitable summer nostalgia 🙂 Though the past few days I can hardly complain about (we’ve been catching a warm southern wind as sometimes happens this time of year). It’s fun to look back through these old photos and find details that you didn’t notice at the time. Frank, sorry just getting back now. Email me at ewesner@gmail.com and I think we can work something out. Thanks for asking. Alice, in the Amish community we call that a milk hack. 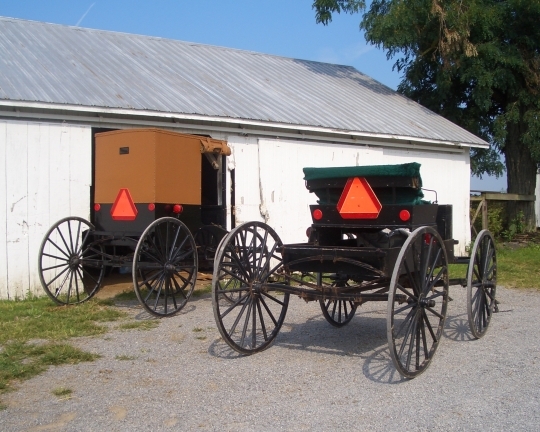 Back in the days when nearly everyone in the Amish community sent their milk to the local cheese house, the milk hack was used to deliver the milk cans to the cheese house. Now days the milk hack is the Amish people’s answer to the pick-up truck. They use the hack to haul anything that needs to be hauled. You know how some “real men” want to drive only the pick-up truck? Well, my Amish grandfather was that way with the milk hack. He used it to go any place he needed to go, even if he had nothing to haul. The two that reminded me of summer were the man plowing and the people in the buggy. The way that buggy is loaded reminds me of garage sales, rummage, sales, church sales, etc. I love to go to those. I agree with Alice-just skip the winter this year. I am dreading winter this year. I now have two houses to shovel out when the snow flies and I know my back is just not going to like me very much, LOL. Speaking of snow we are suppose to get a little tomorrow. No real accumulation but it will be the first of the white stuff for this area this year. 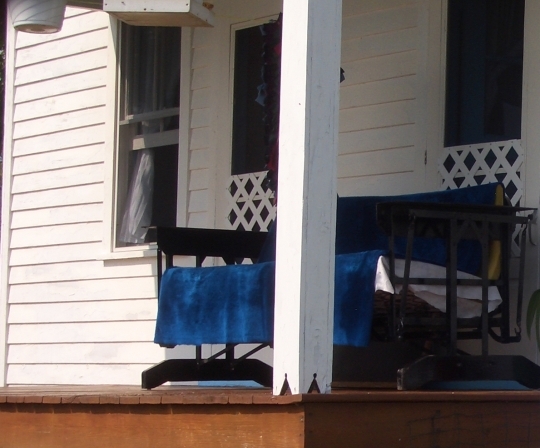 I admire that homemade porch glider. That looks like quite a feat of welding expertise. 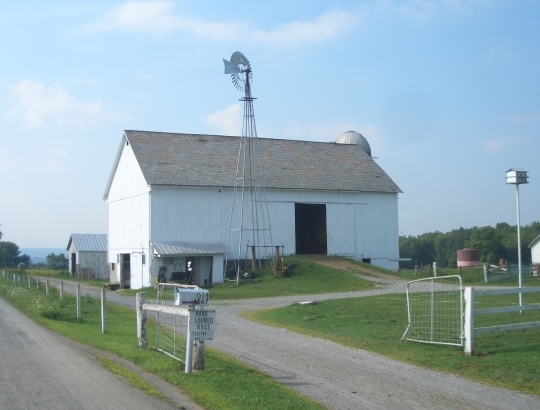 Before my fraa and I moved to Lancaster County, PA, decades ago, I “learned” from one supposedly authoritative source, that a blue gate or door at an Amish place indicated that at least one marriage-eligible daughter resided there. 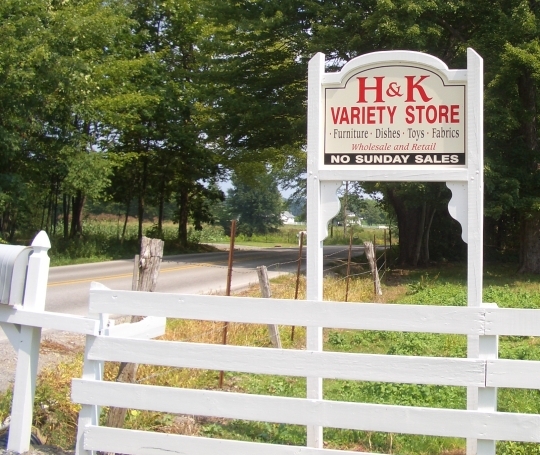 Sadly, I found that it was only a Lancaster County Amish legend–blue gates or doors really meant that either the parents liked the color blue or, even more likely, blue paint was the least expensive can on the shelf. Now I know where the Lancaster myth arose–from LAWRENCE County where New Wilmington is situated. My guess is that a high positive correlation exists between blue gates in the New Wilmington settlement in Lawrence County and the presence of at least one daughter of marriageable age. And I assume that gates remain blue until the last of a family’s daughter or daughters has been picked. But what if the family has an “Old Maid” or two–their term, not mine. I am hypothesizing that keeping the gate blue is a service to the widowers,so that they will know where to find another spouse. So there we have it: my source was right after all, and it all makes sense if we substitue the word Lawrence for Lancaster. Vass dengsht? Rich Stevick BTW, I have yet to visit any Amishg community where a blue gate is needed for suitors to determine where the unmarried daughters reside. I love the pics. Great pictures! I have been there and yes the doors are a novelty, just something someone did and it stuck….like huge eyeglasses, then small…what’s next? I personally hope the smaller ones stay, less weight. Favorite pic…hummmm maybe the porch. I guess I am not ready for outdoor work yet so keep the winter…hot chocolate, warm toasty stove, comfy blanket, a book, ummm yessss! I might tell you different when I am biking on ice and snow to get to work! Rich Stevick..vas ich dengsht? Naw, net so. Young married couples have blue doors. Thanks for sharing a like them all but i think the one with mother and the kids in the buggy i like most. 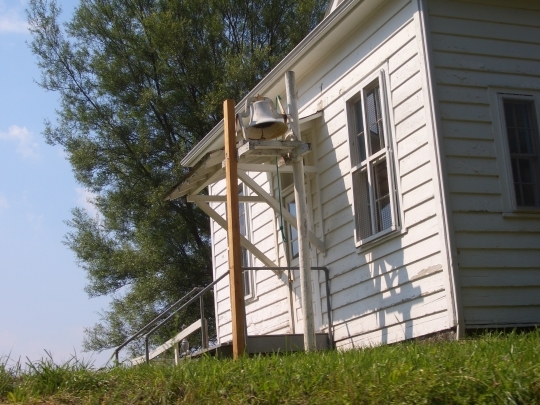 i did see that the school house door was painted blue that was a first for me. I enjoy winter and snow and all, but the first picture of just the field looks enticing. That hay wagon looks like a nice spot to watch clouds or take a nap! I worked for a company from 1981 to 2007 that had a large facility near Mercer, PA which is probably no more than a 20 or 25 minute drive from New Wilmington. Joe, one of the guys that worked there and I became fairly good friends over the years. He was the first person to ever introduce me to any Amish people, and they were his neighbors near New Wilmington, PA. In the picture of the family in the open buggy, third from the bottom, the house in the background looks EXACTLY like his house. 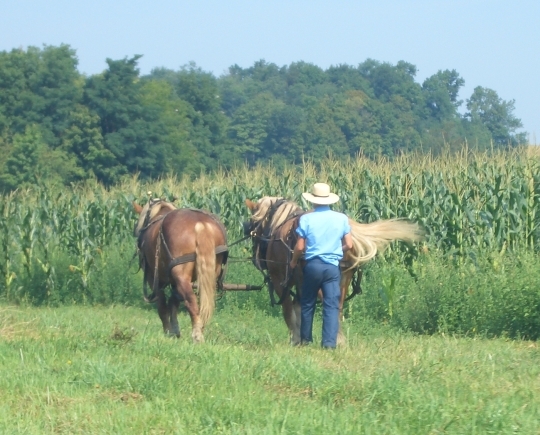 When he bought his home the previous owner told him that the Amish man that was farming the 40 acres that he purchased with the home was concerned that he might not allow him to continue farming it. 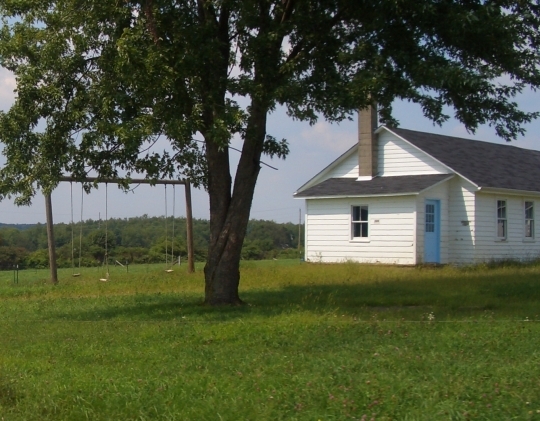 One day shortly after he purchased it the Amish farmer showed up and asked if he would lease the land to him to farm as had the previous owner. Joe said “yes”, so the man wanted to know how much the lease cost would be. Joe told him that he could use the land for free, but the farmer said that he could not do that; he had to pay Joe something. And sounds like quite a coincidence; I wonder if your friend Joe is still there. This photo was taken looking down from an Amish bent ‘n’ dent place, up on a hill rather on the north side of the settlement. Can’t remember the road name but it is one of the main byways. Well Erik, I am disappointed in myself at only recognizing 3 of the shots! And the horses’ behinds isn’t one of them! OldKat, the Bent-N-Dent is likely the one on Rt 158 (Mercer-New Wilmington Rd), which has been open less than a year I believe. I haven’t made it in yet, but it’s the only 1 I’m aware of. Great pictures and I too, have felt the brunt of a few central Europe winters (Deutschland). Summer seems like a fading memory as the first snow of the season is set to arrive in a few hours. I wonder if the New Wilmington Amish make cheese or if there is a cheesehous (factory) in the community. 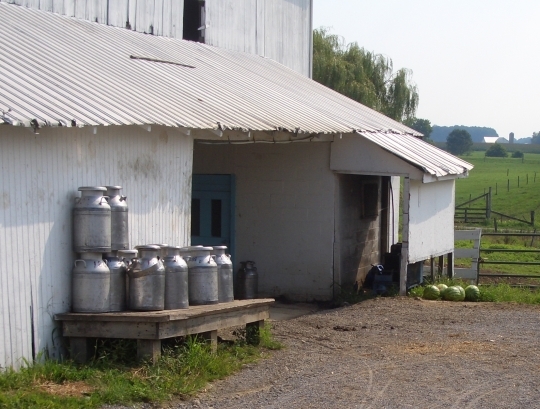 There are milk cans on a milk stand in one picture, which are to be picked up or have been delivered back home by the milk truck.